Saint Dymphna The pain is real - but so is hope. Lord we pray for those who have a mental illness. about mental illness we should not use that phrase. are beautiful creations of God. support those who suffer from any other illness. to remember You love them; they are never alone. 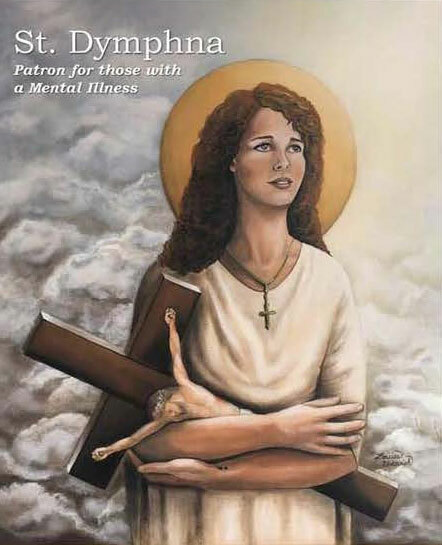 Saint Dymphna, Patron of those with a Mental Illness, pray for us. Dymphna was born in Ireland sometime in the seventh century to a pagan father and devout Christian mother. When she was fourteen, she consecrated herself to Christ and took a vow of chastity. Soon afterward, her mother died and her father - who had loved his wife deeply - began to suffer a rapid deterioration of his mental stability. So unhinged was Dymphna's father, Damon, that the King's counselors suggested he remarry. Though he was still grieving for his wife, he agreed to remarry if a woman as beautiful as she could be found. Damon sent messengers throughout his town and other lands to find woman of noble birth who resembled his wife and would be willing to marry him, but when none could be found, his evil advisors whispered sinful suggestions to marry his own daughter. So twisted were Damon's thoughts that he recognized only his wife when he looked upon Dymphna, and so he consented to the arrangement. When she heard of her father's misguided plot, Dymphna fled her castle with her confessor, a priest named Gerebran, two trusted servants, and the king's fool. The group sailed toward what is now called Belgium, and hid in the town of Geel. Though it becomes uncertain what exactly happened next, the best-known version claims the group settled in Geel, where Dymphna built a hospital for the poor and sick, but in using her wealth, her father was able to discover her location. When Damon found his daughter was in Belgium, he traveled to Geel and captured them. He ordered the priest's head to be separated from his body and attempted to convince Dymphna to return to Ireland and marry him. When Dymphna refused, Damon became enraged and drew his sword. He struck Dymphna's head from her shoulders and left her there. When she died, Dymphna was only fifteen-years-old. After her father left Geel, the residents collected both Dymphna and Gerebran's remains and laid them to rest in a cave. In defense of her purity, Dymphna received the crown of martyrdom around the year 620 and became known as the "Lily of Éire. In 1349, a church honoring St. Dymphna was built in Geel, and by 1480, so many pilgrims were arriving in need of treatment for mental ills, that the church was expanded. The expanded sanctuary was eventually overflowing again, leaving the townspeople to accept them into their homes, which began a tradition of care for the mentally ill that continues to this day. Follow this link to order free St. Dymphna Prayer Cards.